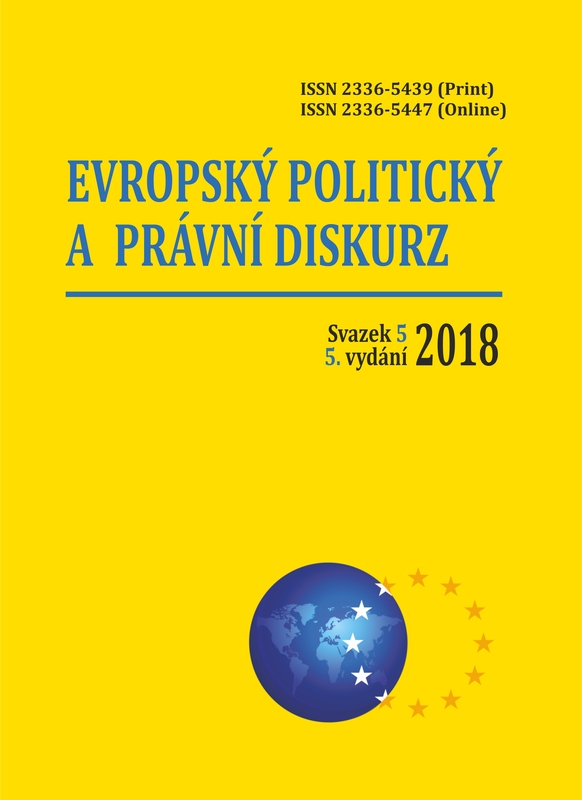 Scientific journal «Evropský politický a právní diskurz» («European political and law discourse») invites Sc.Ds, Ph.Ds, young scientists (postgraduates, doctorates and master degree seekers), specializing in various branches of Legal and Political Science, Social Communications, International Relations and Sociology to cooperation for publication of scientific articles. Contributions to the «European political and law discourse» shall be articles of original research or analysis papers. «European political and law discourse» is a refereed journal. Submissions are subject to academic peer-review. Every submitted manuscript receives at least two professional reviews, at least one of which is a double-blind review. Submissions can be made at any time to the following e-mail address: admedit@eppd13.cz. An initial consideration of the submission by the editorial team typically takes between one and three months. If the submission is accepted for peer-review, this process typically takes another one to three months. If the article is accepted for publication after peer-review, the final editorial preparatory work typically takes another one to three months. Unless otherwise specified, copyright is shared by both the contributor and the «European political and law discourse». «European political and law discourse» has a strict policy against any forms of plagiarism, including self-plagiarism. Any quotation – even a short one – from a separate source shall be followed by the required corresponding reference. Any literal quotation – i.e. word-by-word – shall be provided in quotation marks or separated into a distinct paragraph as a block quotation. Authors are responsible for observing the laws of copyright when quoting or reproducing any and all borrowed material. – not later than the anticipated date of release of the relevant Journal’s issue an author receives electronic version of a journal; and at the beginning of the next month author’s copy of a Journal and reprints from an article are sent. The language of articles is Czech, Ukrainian, English, French and German. publisher’s imprint information in English. Denning, D.E. (1998). Information Warfare and Security. Boston: Addison-Wesley Pub. Co, 99-100. Somit, А., Peterson, S. (2005). The Failure of Democratic Nation Building: Ideology Meets Evolution. New York: Palgrave Macmillan, 5. Тарасов, В. (1997). Советская дипломатия в период Корейской войны (1950-1953). Москва: Научная книга, 134-150. Калюжнова, Н.Я. Лидина, К.Л. Якобсона, А.Я. (2003). Регион на перекрестке Востока и Запада: глобализация и конкурентоспособность. Москва: ТЕИС, 14-21. Kaljuzhnova, N.Ja., Lidina, K.L., Jakobsona, A.Ja. (2003). Region na perekrestke Vostoka i Zapada: globalizacija i konkurentosposobnost [The region at the crossroads of the East and West: globalization and competitiveness]. Moscow: TEIS. [in Russian]. Bakircioglu, O. (2007). The Application of the Margin of Appreciation Doctrine in Freedom of Expression and Public Morality Cases. German Law Journal, 8, 07, 713-714. Bakircioglu, O. (2007). The Application of the Margin of Appreciation Doctrine in Freedom of Expression and Public Morality Cases. German Law Journal, 8, 07, 713-714. [in English]. Musilová, K. (2017). Mozhnosti aplikace konceptu postmaterialnigo shtepeni na substatnih urovnih. Central European Political Studies Review, 19(1), 55-75. doi:http://dx.doi.org/10.5817/CEPSR.2017.1.55 [in Czech]. Nye, J.S., Owens, W.A. (1996). America’s Information Edge. Foreign Affairs, March/April, 49-67. Nye, J.S., Owens, W.A. (1996). America’s Information Edge. Foreign Affairs, March/April, 49-67. [in English]. Задорожній, О., Медведєва, М. (2006). Імплементація міжнародних стандартів захисту прав людини в сфері боротьби з інфекційними хворобами в національному праві України. Український часопис міжнародного права, 1, 64-76. Zadorozhnii, O., Medvedieva, M. (2006). Implementatsiia mizhnarodnykh standartiv zakhystu prav liudyny v sferi borotby z infektsiinymy khvorobamy v natsionalnomu pravi Ukrainy [Implementation of international human rights standards to combat infection disease in domestic law Ukraine]. Ukrainskyi chasopys mizhnarodnoho prava [Ukrainian Journal of International Law], no. 1, 64-76. [in Ukrainian]. Григор’єва, Х.А. (2016). Правові аспекти приватного інвестування у створення сільськогосподарських кооперативів. Правові та інституційні механізми забезпечення розвитку держави та права в умовах євроінтеграції: матеріали Міжнародної науково-практичної конференції (20 травня 2016 р., м. Одеса), 1, 557-559. Grigorieva, H.A. (2016). Pravovі aspekti privatnogo іnvestuvannya u stvorennya sіlskogospodarskih kooperativіv. [Legal aspects of private investment in the creation of agricultural cooperatives]. Pravovі ta іnstitucіjnі mekhanіzmi zabezpechennya rozvitku derzhavi ta prava v umovah evroіntegracії: materіali Mіzhnarodnoї naukovo-praktichnoї konferencії (20 travnya 2016 r., m. Odesa). [Legal and institutional mechanisms the development of state and law in the conditions of European integration: materials of the International Scientific and Practical Conference (May 20, 2016, Odesa)], 1. 557-559. [in Ukrainian]. Salway, S. Contributions and challenges of cross-national comparative research in migration, ethnicity and health: insights from a preliminary study of maternal health in Germany, Canada and the UK. US National Library of Medicine National Institutes of Health. <https://www.ncbi.nlm.nih.gov/pmc/articles/PMC3146864> (2017, лютий, 01). Salway, S. Contributions and challenges of cross-national comparative research in migration, ethnicity and health: insights from a preliminary study of maternal health in Germany, Canada and the UK. US National Library of Medicine National Institutes of Health. <https://www.ncbi.nlm.nih.gov/pmc/articles/PMC3146864> [in English]. (2017, February, 01). Hadiz, V.R., Chryssogelos A. Populism in world politics: A comparative cross-regional perspective. International Political Science Review: SAGE Journals. <http://journals.sagepub.com/doi/full/10.1177/0192512117693908 > (2017, сентябрь, 18). Hadiz, V.R., Chryssogelos A. Populism in world politics: A comparative cross-regional perspective. International Political Science Review: SAGE Journals. <http://journals.sagepub.com/doi/full/10.1177/0192512117693908 > [in English]. (2017, September, 18). Документы, на основании которых власти РФ запрещают деятельность Меджлиса 2016. 15 минут. <http://15minut.org/article/dokumenty-na-osnovanii-kotoryh-vlasti-rf-zapreshhayut-deyatelnost-medzhlisa-foto-2016-02-15-19-18-31> (2017, ию). Dokumenty, na osnovanii kotoryh vlasti RF zapreshhajut dejatel’nost’ Medzhlisa 2016. [Documents on the basis of which the authorities of the Russian Federation prohibit the activities of the Mejlis]. 15 minut. [15 minutes]. <http://15minut.org/article/dokumenty-na-osnovanii-kotoryh-vlasti-rf-zapreshhayut-deyatelnost-medzhlisa-foto-2016-02-15-19-18-31> [in Russian]. (2017, June, 22).